Undoubtedly, Avicenna is one of the great physicians in Islam and one of the greatest thinkers and medical scholars in history. From the autobiographical sketch that has come down to us, we learn that Ibn Sina was precocious. At the age of ten he knew the Qur'an by heart. Before he was sixteen, he had mastered physics, mathematics, logic, and metaphysics and began the study and practice of medicine. At the age of twenty-one, he wrote his famous "Qa'nun", (Canon) which remained the principal authority in medical schools both in Europe and in Asia for several centuries. He served successively several Persian potentates as physician and adviser, travelling with them from place to place. Although he was known to be sociable, he was studious and serious, devoting much of his time to writing. 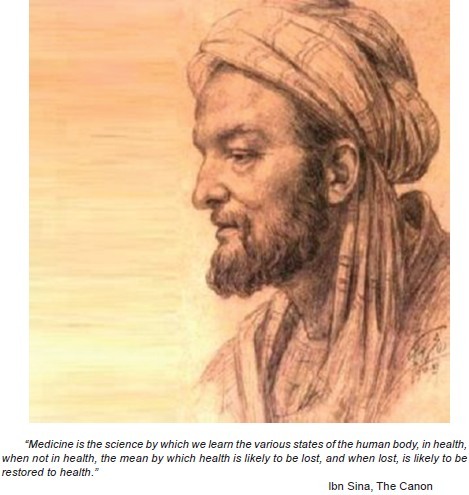 Avicenna often used psychological methods to treat his patients. One anecdote was when a malnourished prince of Persia had melancholia, refused to eat and suffered from the delusion that he was a cow. The prince would moo like a cow crying, "Kill me so that a good stew may be made of my flesh" and would not eat anything. Ibn Sina was persuaded to the case and sent a message to the patient, asking him to be happy as the butcher was coming to slaughter him, and the sick man rejoiced. When Ibn Sina approached the prince with a knife in his hand, he asked "where is the cow so I may kill it." The patient then mooed like a cow to indicate where he was. By order of the butcher, the patient was also laid on the ground for slaughter. When Ibn Sina approached the patient pretending to slaughter him, he said, "The cow is too lean and not ready to be killed. It must be fed properly and I will kill it when it becomes healthy and fat." The patient was then offered food which he ate eagerly and gradually "gained strength, got rid of his delusion, and was completely cured." Every beat of the pulse comprises two movements and two pauses. Thus, expansion: pause: contraction: pause. As a cardiologist, I was drawn to Avicenna's descriptions of the pulse. Taking the pulse is one of the simplest, oldest, and most informative of all clinical examinations. It is a key diagnostic method in most medical traditions particularly ancient Egyptian medicine, Chinese traditional medicine, Greco Islamic, and Ayurveda medicine. Throughout the history of medicine, the pulse was an important parameter in assessing cardiac dysfunction, and the tactile examination of the pulse was referred to as "the messenger that never fails." The character of the pulse is still one of the most important diagnostic clues in modern medicine. Feeling and interpreting the pulse requires great skill. 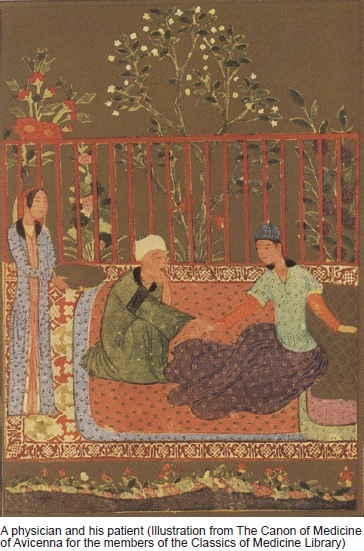 Pulse-taking was a skillful bedside technique in Greco-Islamic medicine and the Middle Ages. "The learned physician should read the happiness and misery of the body by feeling the pulse at the root of the thumb which stands as the witness of the soul." One ailment in the history of medicine where pulse-taking is extremely useful was lovesickness. Lovesickness is an illness that permeates the history of medicine since the time of Hippocrates. Greek physicians considered falling in love a disease that may lead to death. Historically and traditionally, we have metaphorically attributed feelings and emotions as if they actually originated from the heart. The tradition goes back thousands of years and has enriched our language and literary heritage. Pulse-taking has evolved in our time to a highly sophisticated digital beat-to-beat display with blood oxygen monitoring to aid us in making a diagnosis. Hence, careful examination of the pulse is frequently overlooked. Even though pulse-taking is low-tech and inexpensive, a thorough examination of the pulse can provide a lot of information and help form an accurate diagnosis. As students in medical school and during residency training, we were taught that assessment of the arterial pulse characteristics is an integral part of the cardiovascular examination. Carotid, radial, brachial, femoral, posterior tibial, and dorsalis pedis pulses should be routinely examined - bilaterally - to ascertain any differences in the pulse amplitude, contour, or upstroke. Who can remember all the different pulse findings in chronic severe aortic insufficiency? The textbooks describe ten, yet I remember only three (Corrigan's pulse, bisferiens pulse, and water hammer). Imagine my shock and surprise on reading Avicenna's The Pulse in The Canon, a special edition of The Classics of Medicine Library, from the collection of Dr. H.A. Hajar Albinali, who kindly lent me his copy. 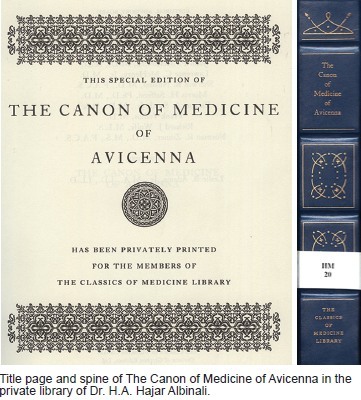 The title reads, A TREATISE ON THE CANON OF MEDICINE OF AVICENNA Incorporating a Translation of the First Book by Cameron Gruner, M.D. (Lond.) and published in 1930. The section on The Pulse is the most detailed and lucid discussion on the features and characteristics of the pulse that I have ever read. Of course, one can find numerous summaries and commentaries on Avicenna's pulse doctrine on the internet and in articles published in medical journals but you would not get the sense of erudition you get on reading the original [translation]. It is a very impressive piece of work. I was quite amazed. Did he personally observe all that or he compiled various observations from various sources? In the English translation that I read, Dr. Cameron Gruner, the translator, has extensive commentary and comparison to ancient Chinese palpation and passages from Galen and other Greek medical writers, so it is very likely that Avicenna compiled them. Nevertheless, it is a remarkable piece of work. The pulse section consists of thirty-nine (39) pages and covers the definition of the pulse; technique in feeling the pulse; reasons for feeling the pulse at the wrist; the emotional state of the patient and the observer; characteristics of the pulse with detailed explanation; discusses normal from abnormal pulse; the varieties of irregularity; effect of age and gender on the pulse; effect of emotion and personality; effect of the seasons; effects of food and drink; effect of sleep; the pulse during exercise; the pulse in pregnancy; the pulse in pain; and the pulse in inflammation. The most interesting is the description on the ten features in the pulse:  (see side bar). In Ibn Sina's classification we recognize certain types of arrhythmias such as atrial fibrillation, premature and dropped beats. He also described different pulses similar to pulses being observed in arterial and ventricular arrhythmias. He described more than fifty identifiable pulses. He distinguished two kinds of irregular pulses: regularly irregular or irregularly irregular, and that the difference might be difficult to appreciate. He compared the rhythm of an irregular pulse to the flight of the gazelle, the "pulsus ghazalans". The rat-tail pulse described by Ibn Sina is similar to what is known as "pulsus alternans" secondary to a weakened myocardium. "You may feel a strong pulse followed by a faint pulse. as if you pass your hand on a rat, you feel the body, then the tail feels small compared to the body." Undulating pulse, dicrotic pulse, and ventricular pulse are a few examples of different types of pulse that were described by him. Ibn Sina also compared pulse rhythms to musical rhythms. The musical character of the pulse did not escape his attention for he was an accomplished poet. Some of his pulse descriptions are written in the form of Arabic poetry [the Canon was written in Arabic]. It has been over 1000 years since Ibn Sina described the characteristics of a normal and abnormal pulses and how environmental and various conditions and stimuli affect the pulse. His thesis on the pulse is remarkable and many of his remarks on the pulse are still true today but pathological correlation was absent. This is because at that point in time, postmortem examinations were not done or forbidden. Our knowledge and understanding of the pulse in health and disease have evolved by leaps and bounds since then. We know so much more about the pulse now because of the widespread availability of the ECG, sophisticated digital beat-to-beat monitor display, and electrophysiological studies. Unlike the time of Ibn Sina, we have specific therapies for different types of arrhythmias. It is well-known that the Arabs preserved most of the wisdom and knowledge of antiquity in their writings when Europe was plunged into the Dark Ages. The knowledge and scholarship were re-translated back into Latin during the Renaissance by monk scholars, and medicine was no exception. It is therefore not surprising to find that Ibn Sina's descriptions of the pulse have been described by the Greeks before, most notably by Galen who controlled medical thinking for centuries. Galen's teaching on the pulse dominated clinical practice for about sixteen centuries. Some of his books on the pulse have been lost but eighteen books are known to be extant and are regarded as authentic. Many journal articles have reproduced Galen's descriptions. I find the similarity in the doctrines and descriptions of the pulse by Galen and Ibn Sina quite striking and startling. Clearly, Ibn Sina subscribed to Galen's pulse doctrines. What is felt by the fingers must be described to give shades of meaning to a purely subjective perception. Ancient scholars often resorted to comparing pulse rhythms to the motion of animals and Ibn Sina was no exception. As already mentioned, he compares the rhythm of an irregular pulse to the "flight of a gazelle" or pulsus ghazalans, and this was described earlier by Galen as the "leap of a goat", or pulsus caprizans. Reading such pulse metaphors is rather charming but no longer helpful in our technical-oriented world. Nevertheless, against a background of modern knowledge, I still find Ibn Sina's pulse descriptions extraordinary. Avicenna was a product of the rich intellectual, cultural, and scientific ferment that swept the Islamic world. He created a complete philosophical system in the Arabic language. Among the great sages of Islamic medicine, Ibn Sina is the best known in the West. Considered as the successor to Galen, his great medical treatise, the Canon was the standard textbook on medicine in the Arab world and Europe in the 17 th century. He was a philosopher, physician, psychiatrist and poet. Like Galen, he devoted a large portion of his work to the study of the pulse and his contributions to the field of sphygmology were significant. 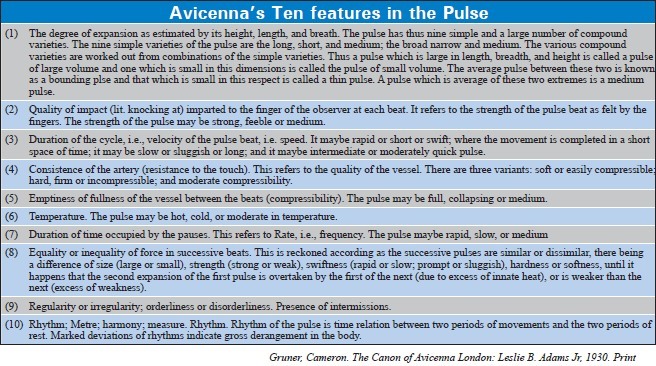 Avicenna comprehensively covers the subject of the pulse, describes the technique of pulse-taking and records the effects of a variety of conditions on the pulse such as environment, physical condition of patient and emotional states such as anger, pleasure, joy, greaf and fear. Like Galen, he describes ten features in the pulse and more than fifty identifiable pulses. He described different pulses similar to the pulses being observed in arterial and ventricular arrhythmias. According to Avicenna, vital power, resistance, and elasticity, were important in the quality, size, and volume of the pulse. He defined concepts such as resistance and elasticity in a physiological manner. Feeling the pulse is simple, fast, and inexpensive and is still a very useful diagnostic technique. Ibn Sina's descriptions and concepts on the pulse are the foundation for our current state-of-the-art knowledge on the pulse, arrhythmia, and electrophysiology. It is of course impossible for physicians to note all the characteristics of the pulse on palpation as described by Ibn Sina one thousand years ago, but still, many of his observations on the pulse in health and disease are valid today. Although many Western historians choose to believe that the Arabs were merely transmitters of Greek achievements, it cannot be denied that Islamic philosophers, scientists, and physicians added their own observations and wisdom to the knowledge that they acquired from more ancient civilizations. They made many original contributions to mathematics, astronomy, physics, alchemy, optics, pharmacology, and medicine. Ibn Sina may have been a follower of Galen but he made many pioneering contributions. Historians agree that he is one of the greatest thinkers and medical scholars in history. He is rightly called the "Prince of Physicians" of his era. 3. Hakeem Abdul Hameed, ed. Avicenna′s Tract on Cardiac Drugs and Essays on Arab Cardiotherapy, New Delhi, India: Hamdard Foundation Press, 1983. Print.